If you’re like most people, you might be pretending that despite the raked leaves, frosty mornings and occasional dusting of snow, winter is still far away. Or maybe you’re thinking that given last year’s virtually nonexistent winter and lack of snow, we’re in for the same this year. Either way, it’s hard to imagine getting excited about the task of hauling out the snow tires and heading to the garage for a changeover. But if your tires are stored properly and easy to access, this seemingly fraught task is simple. At Nuvo Garage, our garage renovations are designed to maximize storage and organize your belongings efficiently. Tires require a designated space for safe storage. Many of our clients opt for wall tire racks, which can accommodate tires with or without rims. These racks are mounted securely to the wall and ensure that the tires don’t touch the floor putting unnecessary pressure on the rubber. This configuration is especially practical for people with physical limitations who are unable to lift heavier objects or for people who simply would rather not. Depending on what other items you want to store and the size of your garage, cabinets are another close-to-the-floor option that also keeps tires out-of-sight for a sleeker look. These cabinets must be at least 48 inches deep and 30 inches high to fit most tires. For tires without rims, we often suggest overhead storage solutions that also include room for storing heavy-duty floor mats and other out-of-season belongings. 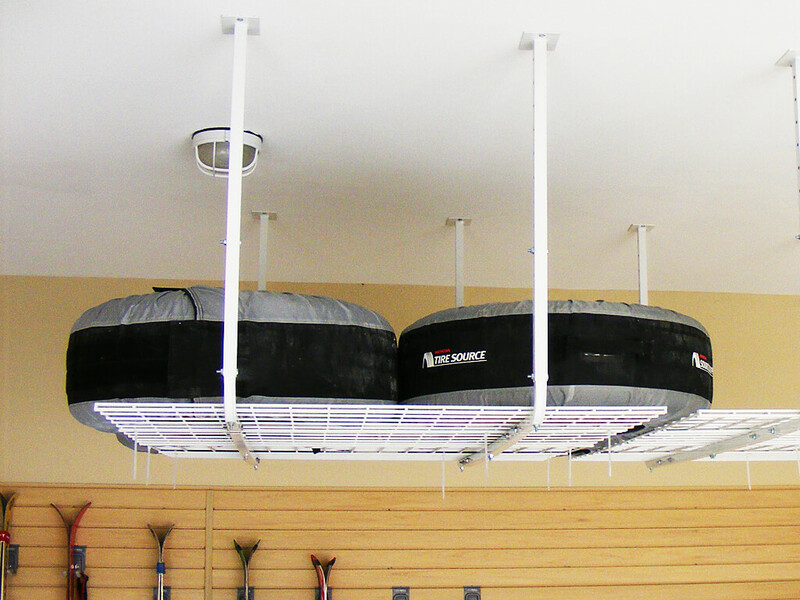 One of our more common installations involves suspending steel racks from the ceiling. This system is both strong and secure while also being easily accessed by a stepladder when you need take care of the seasonal tire changeover. It’s also a good option for people with one or two sets of tires. Platforms can support more weight so I often suggest them for clients with multiple vehicles, sets of tires and other automotive accessories. Of course for people with very large garages and a penchant for high-tech storage solutions, we recommend hydraulic lifts. These sit flat against the wall and lift the tires but since you can’t store items underneath, you’ll need space to accommodate the snow blower, bicycles, garden equipment and any other things that live in the garage. Proper tire storage is easy and doesn’t require a lot of space or expense, just a bit of planning so you can transition effortlessly from season to season. Make your life easier with a Nuvo Garage transformation. That way you’ll always know where to find everything when you need it, and in winter you’ll even be able to park your cars in the garage where they belong and save time clearing snow off windshields in the morning. To ensure minimal disruption, our renovations can be completed in as few as two days. I’d be happy to come over to discuss options and give you an estimate.